Kim Dellow - Page 187 of 190 - Mixed media art inspiration and videos. So this card uses stamps from Stampendous and is coloured in with watercolour pencils. Flower background is made with flower stamps and butterfly stamps from the same set. 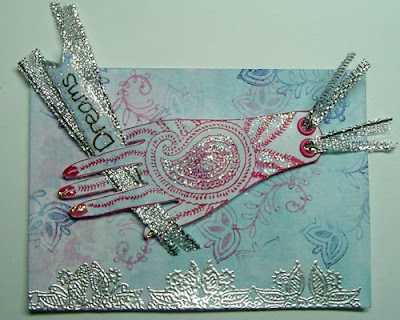 Tearing, inking edges, ribbon and using safty pins with beads finishes this card. The Challenge over at Tag You’re It this week is a fab colour scheme of Aubergine (eggplant), Olive and Ivory. What a great colour combo. Hope you like what I’ve done, it was fun to do. So this tag was put together by stamping the image in aubergine onto white paper coloured with an olive ink pad. The corners were curled with a knitting needle and then the image was layered onto aubergine-textured card. The corners of this layer were also curled. 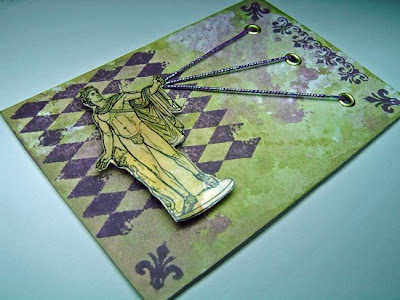 This was then in turn layered onto an olive, textured card stock tag and the edges coloured with a dark olive ink pad. Aubergine and ivory buttons and embroidery thread were used to embellish the tag. An aubergine-coloured eyelet and some ivory, aubergine and olive ribbons and rickrack finishes the tag off. A new week and a new ATC. The theme this week from Think Monday – Think ATC is ‘Hands’. The background is coloured with blue and pink ink pads using a brayer and water spritzer. Small Indian-style flowers are stamped onto the background in pink and blue and a border is embossed in silver. All the stamps used were from Avec. 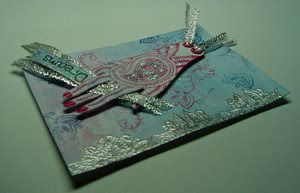 Glitter glue, ribbons and a handwritten sentiment finish this ATC. 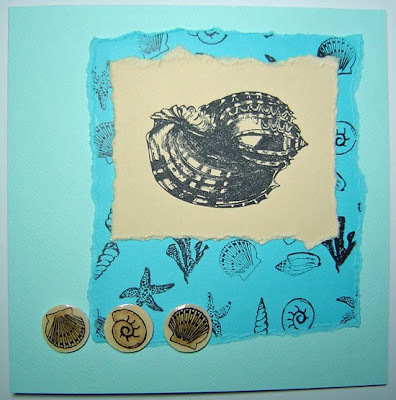 The card was made from shades of blue, torn edges, stamped with shells and accented with individual shells coloured lightly with pencils and then covered in three-dimensional glue. 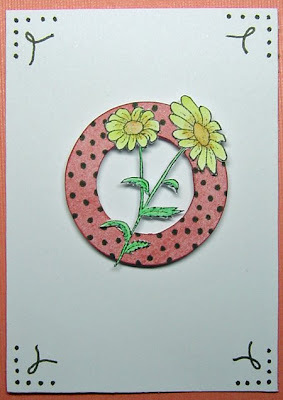 The challenge from Think Monday – Think ATC has the theme of circles this week. So here is my interpretation. The flower is stamped and coloured in with Marvy pens. The circle is coloured with an ink pad and the dots and doodles drawn in by hand. This is a bit of a tongue-in-cheek 4×4 for Funky Fairy blog who are doing a Tri-challenge, so anything to do with ‘Tri’. I have used triples with three birds and three colours. This 4×4 is also for the My Time to Craft challenge blog which this week has the theme of ‘birds’. Put together with stamping and pencil colouring. The birds are stamped, coloured, cut out and then covered in 3-dimensional glaze glue. This week’s challenge over at Arty Girlz is a Faces theme. So here is an ATC stamped with distress ink onto a distress ink-coloured background. 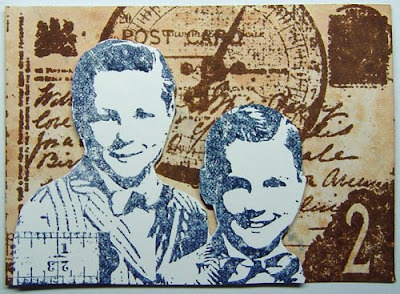 The two boys were then stamped using Marvy Le Plume pens and cut out and layered onto the background. 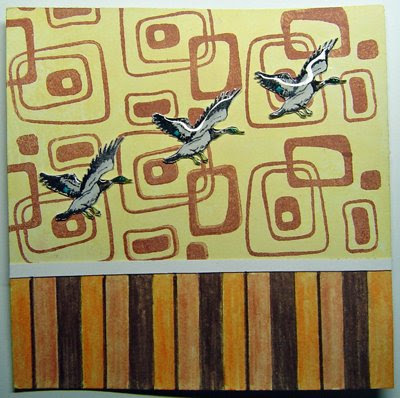 So here is an ATC for the Theme Thursday Challenge, which this week (well until tomorrow – better late than never) has a Man theme. 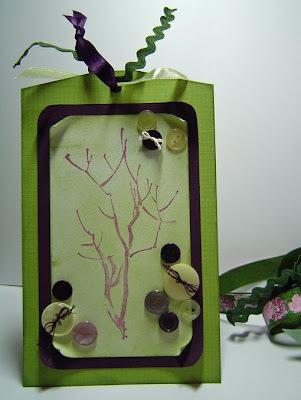 This ATC is coloured with green and purple distress inks using a spritzer and a brayer. Then stamped with the Harlequin pattern and the ornate borders. 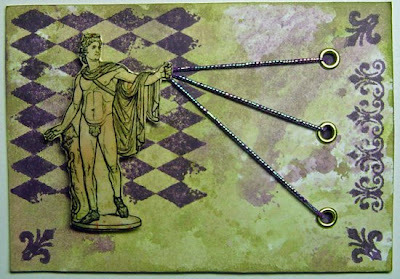 The Statue of Apollo is actually on a transparency and I’ve used 3-dimensional glue mixed with cosmic shimmer to attach it to card coloured with the distress inks. 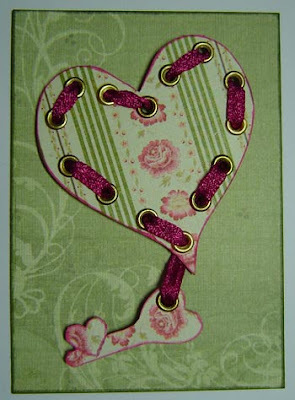 Eyelets and sparkly elastic thread finish this ATC. So first I coloured the paper with light brown distress ink and then stamped using a mask to create the ‘E’ on one side of the tag. The ‘E’ side was stamped with a map and the rest was stamped with various travel-related stamps in a random sequence. I then continued colouring using the masks and green distress ink. Once the paper was dry I went about adding more colour with chalks. Having a change of heart, I cut the ‘E’ out, edged it with a sepia ink pen and layered it with foam next to the background to get the 3-D shape. 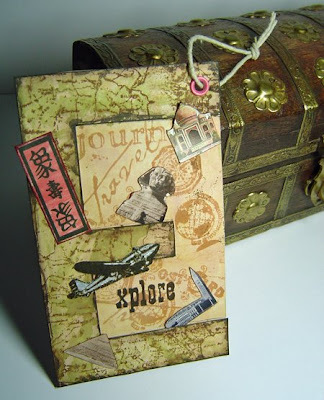 Adding the pictures from some travel mini-postcards and finishing the tag off with an eyelet and some string. 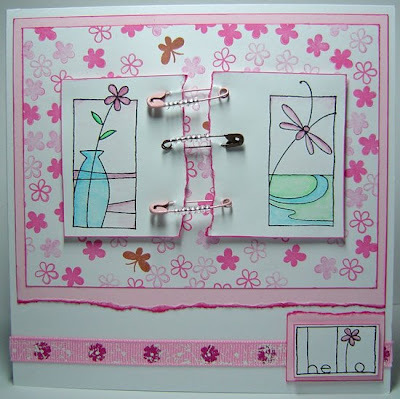 Also put this up on the Trimcraft forum for a stamping challenge! Not been up to much craft-wise this week, hope to get something done this week. 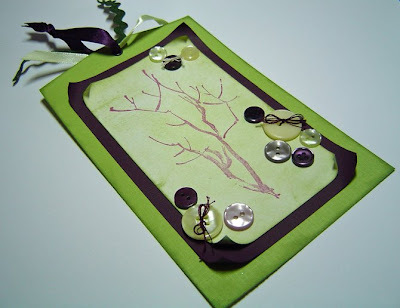 I have got a recently made ATC that uses eyelets that I thought I would put up onto the My Time To Craft Challenge blog. The ATC uses K&Company papers with the the heart and key cut out and edged with pink ink pad. The whole ATC was edged with green ink pad.